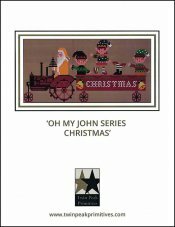 Oh My John Series: Christmas [G1175] - $13.00 : Yarn Tree, Your wholesale source for cross stitch supplies. Cross stitch pattern by Twin Peak Primitives. Look who is coming to town....Santa & his elves! Santa is driving the tractor while the elves stand in the back of the Christmas wagon. There must be one hard gift to get to or else Santa wasn't watching the holes he was going over, because one elf is upside down in the wagon. Stitch count is 160W x 71H. Stitched on #7548 Zweigart Aida 14ct. Dirty.